Much of the debate within mainstream macroeconomics about the current crisis takes place within the limits imposed by the AS-AD model (as illustrated in the video above). Either the problem is aggregate demand (as Keynesians tend to argue) or aggregate supply (the side neoclassical economists tend to focus on). Each side presents an analysis of the cause of the crisis—and, with it, the preferred solution: economic stimulus (through fiscal and/or monetary policy for the Keynesians) or tax cuts and other supply-side measures (basically, additional incentives for the so-called “job creators,” as neoclassical economists see them). And then, of course, there’s the ever-shifting middle position (sometimes more Keynesian, other times more neoclassical) and the corresponding policies: a bit of economic stimulus and a bit of supply-side incentives. That’s all familiar territory for anyone who’s been following the macroeconomic debates (in both political and academic circles). And it’s certainly the way macroeconomics is taught to thousands and thousands of students every year. But what has gone largely unnoticed in these debates is the presumption that aggregate demand and supply are independent of one another (not unlike in the microeconomic counterpart, the supply and demand conception of individual markets). In other cases, the only way the initial equilibrium is undone is because there’s an exogenous change that affects either one side or the other: either aggregate demand or aggregate supply (or, at the microeconomic level, market demand or market supply). The underlying cause is on one side or the other. But what if changes on one side affect the other? In my view, that’s why the recent paper by Dave Reifschneider, William L. Wascher, and David Wilcox [pdf] of the Federal Reserve Board is receiving such attention. 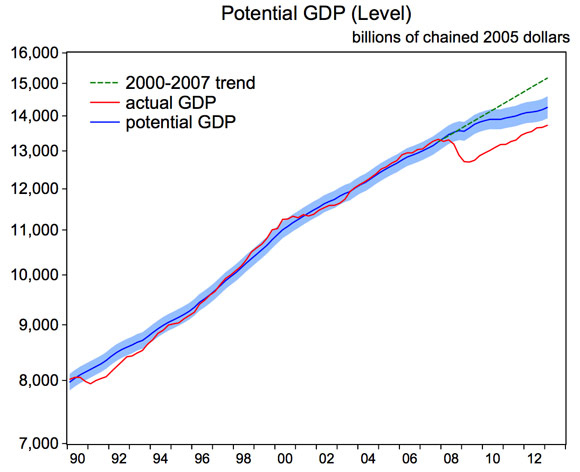 What their study shows is that potential GDP “is currently about 7 percent below the trajectory it appeared to be on prior to 2007.” In other words, the future growth potential of the economy (the blue line in the chart below) has been undermined by the current downturn in economic activity (the red line in the chart), both of which are below what might have been the case if past trends had continued (the green line). It’s as if economic resources had been destroyed by not utilizing them in recent years.